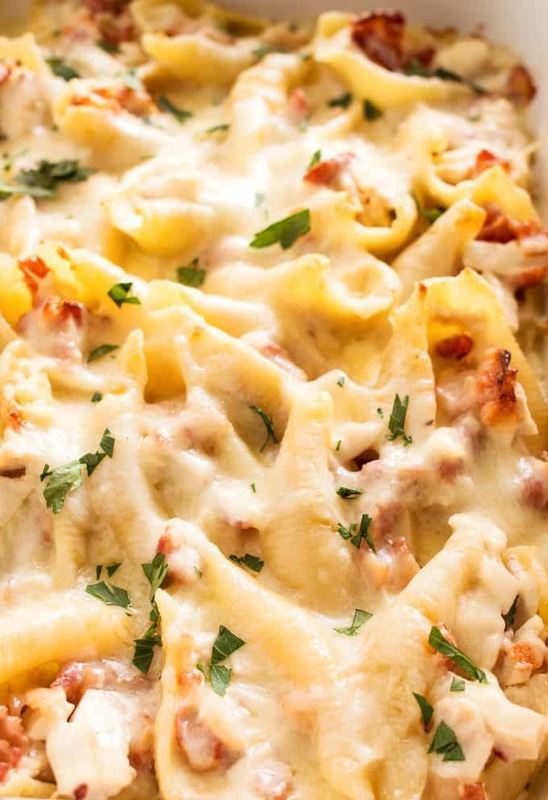 These chicken bacon Alfredo stuffed shells are perfect for Sunday supper! 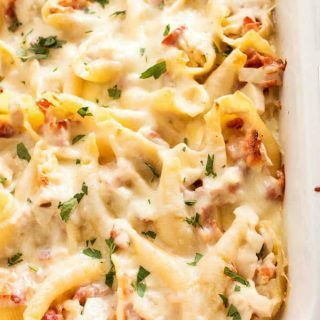 Use store bought Alfredo sauce or homemade for an extra special touch. Sunday is meant for big dinners and delicious food. I don’t care if its breakfast, lunch or dinner – I want to eat on Sunday. Especially in the winter – this is why I have winter pants and summer pants, not just because of the weather! Heck, you could probably even stuff all of the shells and put the whole casserole dish in the fridge until you’re ready to starting baking. How’s that for saving some time? Prepping ahead of time is one of the ways I find time to get out and enjoy myself. The key is a sharp knife and a plan. I haven’t been honing my knife skills for years for nothing. I always figure out what needs to be cut or prepped and have it ready to go. I will do all of my recipe prepping before I start cooking, even if I’m just making some of the components for my next recipe. Speaking of plans, this recipe is part of my Peapod Easy Weekly Meal Plan. 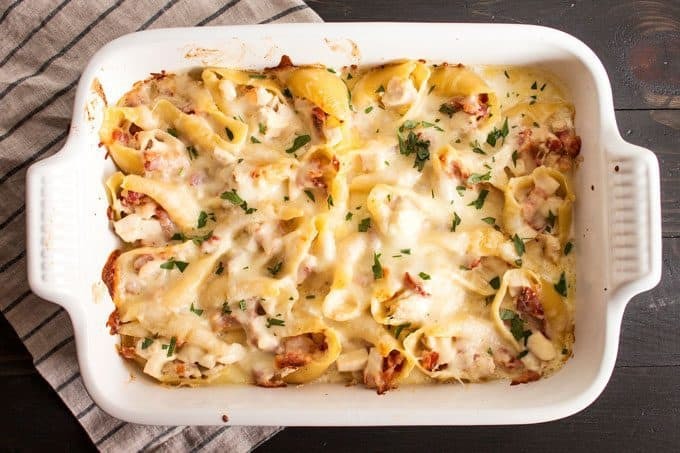 It has breakfast, lunch and dinner ideas for 7 days and these chicken bacon Alfredo stuffed shells are the Sunday night special. 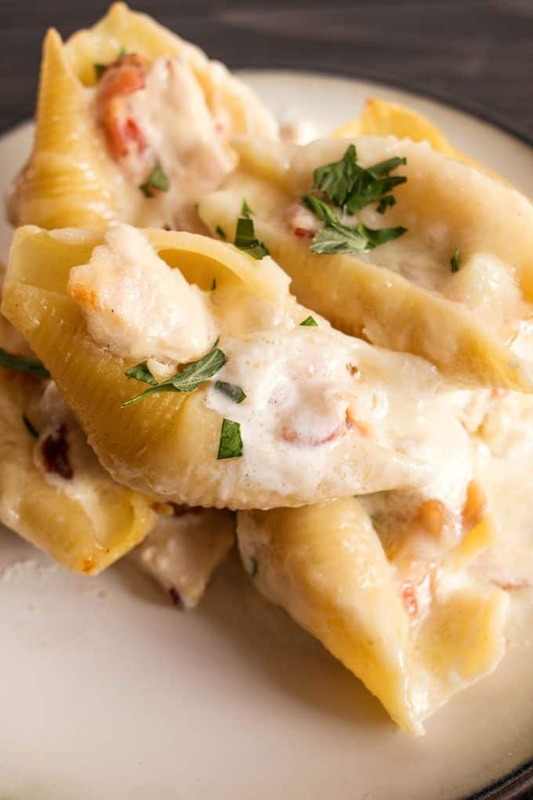 This recipe for chicken bacon Alfredo stuffed shells is part of a weekly meal plan I created. Go to FromthePod.com now for the entire meal plan. Cook jumbo shells according to package directions. Drain and lay out on parchment paper to dry. 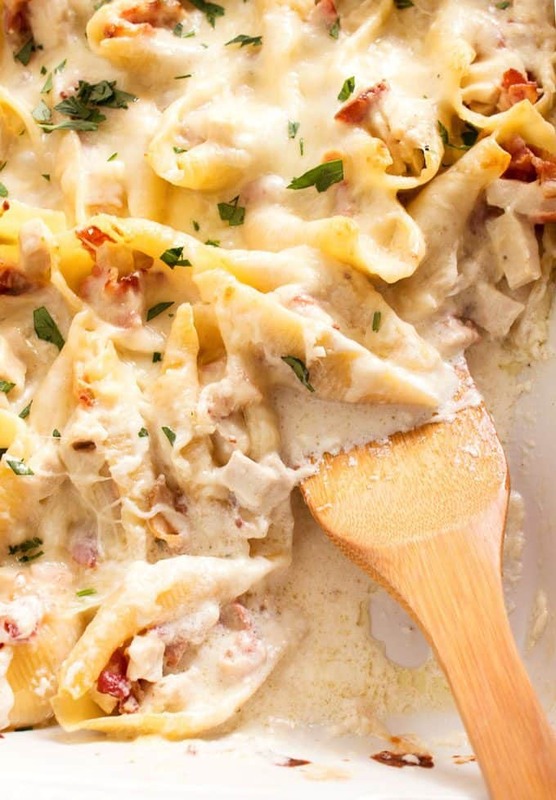 In a medium bowl, combine chicken, bacon, garlic and 1 cup of Alfredo sauce. In the bottom of a 9x12 baking dish, spoon 2 tablespoons of Alfredo sauce. 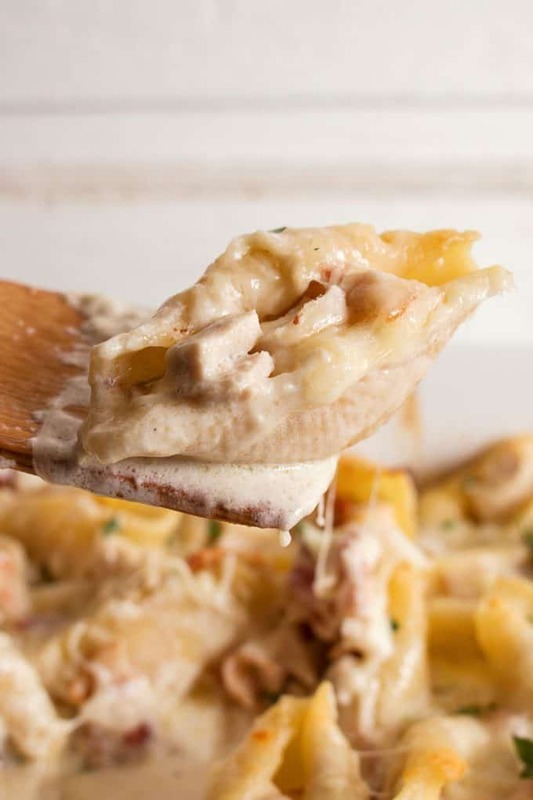 Fill the shells with the chicken and bacon mixture and place in the baking dish on top of the Alfredo sauce. 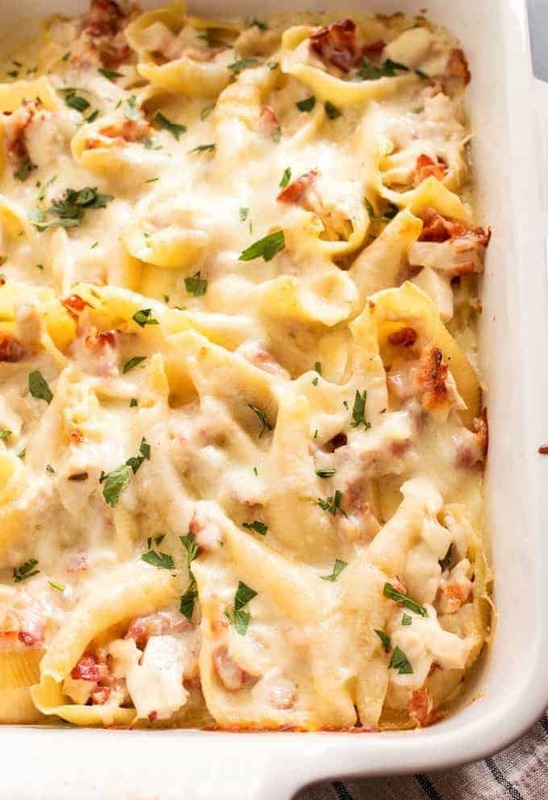 Pour the remaining Alfredo sauce over the stuffed shells. Top with the mozzarella and parmesan cheeses. Place baking pan uncovered in the oven and bake for 25 minutes. Remove from oven and serve hot. This is such a great dinner! All the things my family loves! Can’t wait to try it!! Oh my goodness I am loving the addition of the bacon! What a delicious dish! Love how easy this is! Perfect for Sunday supper! I love pasta for dinner! This looks amazing! This is serious comfort food!! Can’t wait to try this on my family!